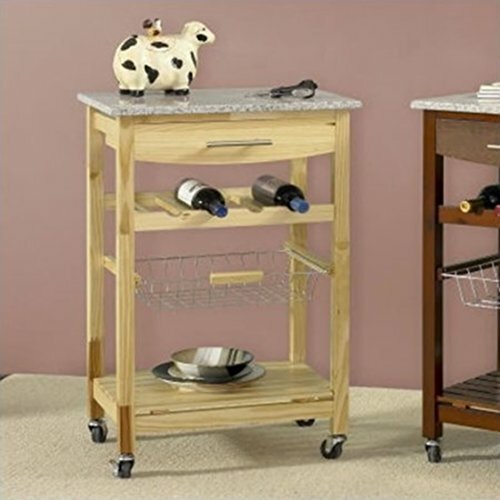 Get organized and add extra counter and work space to a kitchen or bar with this Granite Top Natural Kitchen Island Cart with 4-Bottle Wine Storage Rack. This kitchen island cart features a slide-out wire storage basket with a handle for keeping fruits or veggies and a wine storage rack, which can hold up to four bottles. The legs, drawer and lower shelves are constructed of wood and the top is crafted of polished granite for added durability and visual appeal. The upper back portion of the cart is fully finished. Ideal for expanding kitchen or bar work space, this rolling kitchen island has a rich natural finish and chrome-finished hardware that will blend with many decor styles. If you have any questions about this product by Linon Home Decor Products Inc, contact us by completing and submitting the form below. If you are looking for a specif part number, please include it with your message.